(Nanowerk News) Danish nanophysicists have developed a new method for manufacturing the cornerstone of nanotechnology research – nanowires. The discovery has great potential for the development of nanoelectronics and highly efficient solar cells. It is PhD student Peter Krogstrup, Nano-Science Center, the Niels Bohr Institute at the University of Copenhagen, who developed the method during his dissertation. 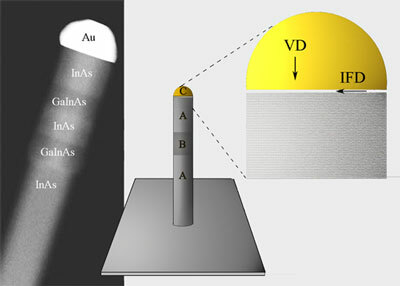 A nanowire made of the two semiconductors gallium indium arsenide (GaInAs) and indium arsenide (InAs) with gold (Au) as a catalyst. To the right a schematic illustration of the new cultivation method, where the semiconductor materials can move both from the top of the gold droplet and from the underside. Today only approximately 1 % of the world’s electricity comes from solar energy. This is because it is difficult to convert solar energy into electricity. It is a great advantage for the researchers to be able to combine different semiconductors in the same nanowire. - This sharp transition between the two semiconductors is necessary for the current – in the form of electrons, to be able to travel with high efficiency between the two materials. If the transition is soft, the electrons can easily get caught in the border area. The new mixed nanowire can be beneficial for many areas of nano research around the world, says Peter Krogstrup, who has been working at the Danish III-V Nanolab, operated in collaboration between the University of Copenhagen and the Technical University of Denmark. A new collaboration between the company SunFlake A/S and The Danish National Advanced Technology Foundation has been kicked off this week. SunFlake A/S uses nanowires to develop prototypes of solar cells and they can also benefit from the new method in their continuing work. The nanophysicists’ discovery has just been published in the prestigious scientific journal Nano Letters ("Junctions in Axial III-V Heterostructure Nanowires Obtained via an Interchange of Group III Elements").